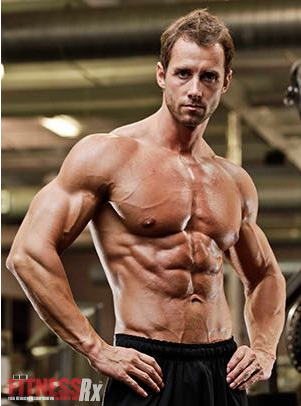 Matus also eats a healthy diet all year, so that the hard work he invests in his abs is visible at all times. “Anyone can have 20-inch arms or a huge chest, but having a shredded six-pack shows the real level of fitness, and that is the first thing people notice about you when walking shirtless on the beach.” We talked to Matus to get the lowdown on what he does to build his showpiece body parts. Various presses form the foundation of Valent’s chest routine, but he always starts with the all-time most popular version— the flat barbell bench press. “It makes sense to begin any workout with the most basic and productive free-weight exercise for the chest muscles while I’m fresh,” he says. He’ll do a total of 8 sets, pyramiding up in weight and down in reps for 5 sets, then reversing the order for a final 3 sets. After a few more sets on a pec deck, his next pressing exercise for chest is the seated Hammer Strength machine press. Along with barbell and machine presses, Matus includes dips as a highly effective compound movement to assist his chest exercises. “I do these leaning forward on chest day, and upright when I use them to work triceps.” His own bodyweight provides sufficient resistance for 4 sets of 12 reps.
Valent does his share of lateral raises, but he also devotes time to other isolation movements to target the anterior or front delts: the front raise performed in alternating fashion with dumbbells, then with a barbell. 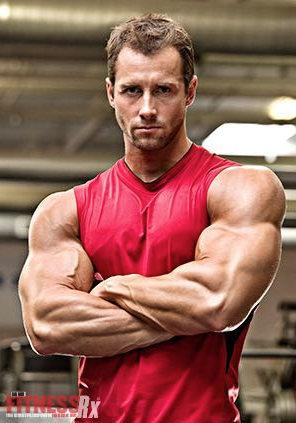 “Most of the time I’m photographed either straight on or from just a slight angle, so maximal development of my front delts is critical,” he explains. The hanging leg raise is an excellent exercise to hit the often hard-to-reach lower abs. Strict form pays dividends, so avoid swinging the legs and make the movement slow and controlled.